Showing results for tags 'anshe chung'. #1 FAVORITE LAND COMPANY 2013, 2015 and 2016!﻿ Settle down on the Azure Islands, one of Second Life's most exquisite estates, est. 2005. The Azure Islands offers some of the most well-developed and terraformed land in Second Life. Various selections of land sizes to choose from, all tailored to fit everyone’s budgets and needs. Visit ANSHEX.COM your ultimate way to find land you want. 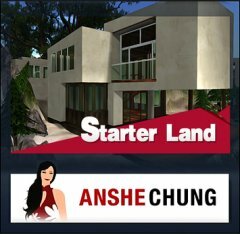 Rent an island and get a free rezzer that you can use to design the whole sim instantly: move, delete and add other objects as needed. This pre-built Island come with beautiful landscaping already in place, no work required! Live and do business in Azure Islands and experience the following perks: LAND OPTIONS • Stand-alone Full Prim Regions and Homesteads are available for those who seek total land control by utilizing their full Estate Rights ability and no covenant to worry about. • Relax on the residential parcels or establish businesses on commercial parcels with either Moderate or Adult ratings. SECURITY • Azure Islands is the biggest ACS estate with over 700+ sims. • Its main continent has been operating since May 2005, and its presence in Second Life has been operating even longer. • All transactions, rentals and land ownership are ensured safe by Anshe Chung. FEATURES • Access to more than 100 + connected sims for flying, sailing, skydiving, surfing and more! • Choose from islands, quiet subdivisions, sky terrains, road-side lots, ocean front parcels and even starter lands! • Newest server hardware available in Second Life • Real-time sim performance monitoring • Access to ACS estate sandbox • Easy to use billing system that lets you pay in USD or L$ for however long you wish to pay at a time • Rent transferable anywhere within Azure Islands • Full access to the fast growing Anshe Chung Library with 1000+ high quality meshed items • Fun community activities like weekly raffles, classes, referral programs and events • Enjoy 5% - 30% region prim bonus on selected lands • Several themes to choose from, Paradise Beach, Pleasure Island Beach, Vampire Island and many more! Many of which actually allow you to OWN the objects and move, unrezz, rerezz them etc. SUPPORT • 24-hour quality customer support • Experienced land management team WEBSITE AND SOCIAL MEDIA Website: AnsheX.com Facebook: http://www.facebook.com/candyazure.estate Email: support.azureislands@gmail.com OUR PRICING • The Azure Islands are competitively priced, no set up fee and no premium account needed. Homesteads: 7599L$ per week Full Regions 20k Prims: 16999L$ per week Full Regions 30k Prims: 17999L$ per week Interested? Please contact Candy Azure in-world or teleport to our sales hub in the sim "AzureIslands Welcome".